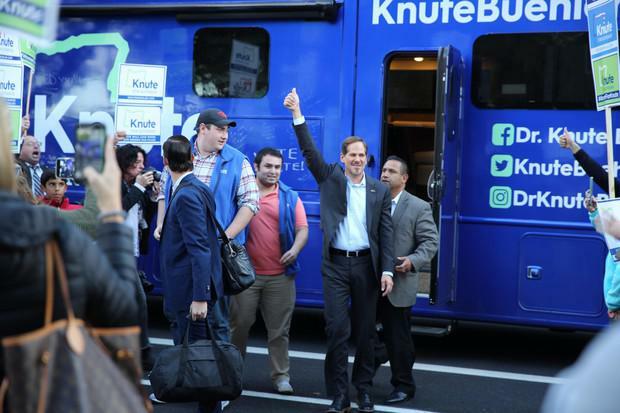 State Rep. Knute Buehler, seeking middle ground on immigration issues in his race for governor, criticized the Trump administration Thursday for pursuing rule changes that could hurt health care for immigrants. Buehler blasted a proposed rule from the Department of Homeland Security. It would make it harder for immigrants to win permanent residency in the U.S. if they use Medicaid and other public health programs. Buehler has been facing heat from immigration advocates upset at his support for Measure 105. That initiative would repeal Oregon’s three-decade old sanctuary law, which limits state and local police cooperation with federal immigration authorities. Democratic Gov. Kate Brown has criticized Buehler for supporting the measure, which she argues could lead to racial profiling and discourage immigrants from reporting crimes to the police. He added that he differed with the Trump administration on several immigration policies. He said he backed protections for immigrants brought here illegally as children, and opposed the administration’s policy of separating children from parents seeking to cross the border. Brown’s campaign spokesman, Christian Gaston, charged in a statement that Buehler is “twisting himself in knots trying to cover up his record” in the Legislature on health and immigration issues. Among other things, he cited Buehler’s vote against a 2017 bill aimed at providing health coverage to all children, including undocumented immigrants. Buehler said at the time that he couldn’t justify the added cost of the legislation.